Perfect for experienced rafters or adventurous first timers! 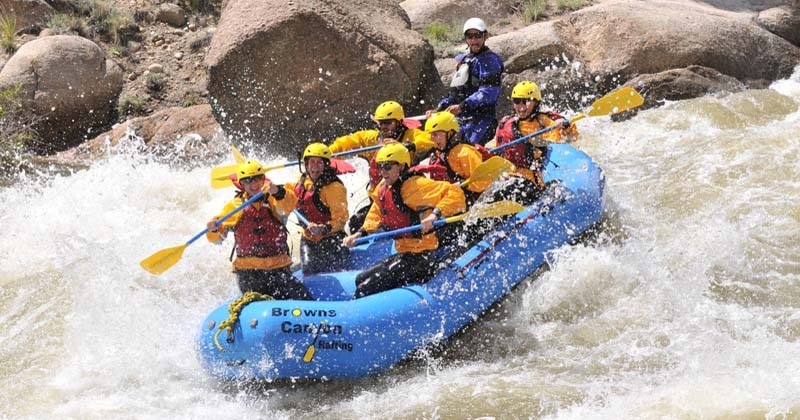 White water rafting in Colorado has been around for well over a century. The Numbers section of Colorado’s Arkansas River got its name in the late 1800s by local miners who viewed the rapids as a “number” of non-navigable landmarks. Thanks to new white water rafting technologies what was once thought to be impossible is now nonstop fun! Our Numbers half day trip offers some of the best white water rapids on the Arkansas River and in Colorado! This exhilarating run is recommended for rafters over 15. Meet us in Buena Vista at our whitewater outpost. Trip times are at 10 am and 12:45pm. Each Numbers trip includes wetsuits, booties, splash tops, and all of the safety equipment needed for this wet and wild ride. Try not to miss the majestic views of the Collegiate Peaks as your expert guide assists you in navigating eight Class IV+heart pumping rapids and the continuous white water in between. Experience huge drenching waves and steep drops through your 6 mile, action packed adventure. We are sure to give you and your group the thrill of a lifetime with this rafting tour. Our half day trips meet everyday at our Buena Vista, Colorado white water outpost, trip times are at 10 am and 12:45 pm. Call our Colorado white water adventure experts for more information, or to customize a time that best suits you and your group. (719) 275-2890; we are here to guide you through your whole experience. Wetsuit, Splash Top & Booties included!